We had some barley in the pantry, sitting there since ages. At my call “What can we possibly do?”, my husband answered “Isn’t there a Scottish soup with barley?”. 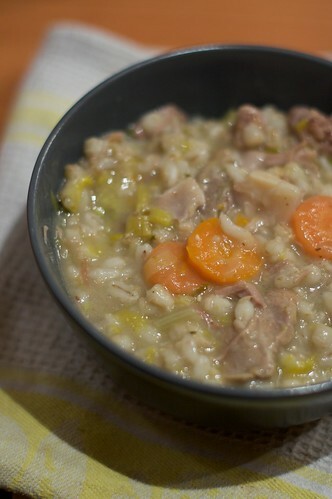 And there was, of course: Scotch Broth! Bring the water and lamb to the boil. Add the barley, cover and cook for 1 and 1/2 hour. Clean the vegetables: trim, peel and slice the carrots, trim and slice the leek, trim and slice the celery, slicing even the leaves. After the lamb and barley are cooking since 1 and 1/2 hour, add the vegetables, salt. Stir and cover. Let it cook for another hour. Check for thickness: it has to be tick, not too watery. Serve still hot, with warm bread&butter. I freezes perfectly (if all the ingredients were fresh at the beginning).